Woah woah woah, how are we a quarter of a way through 2017 already?! I usually find the first few months of the year usually feel like the longest, but not this year. I would very much like time to slow down because I have got so much fun stuff planned and I want to enjoy every minute. 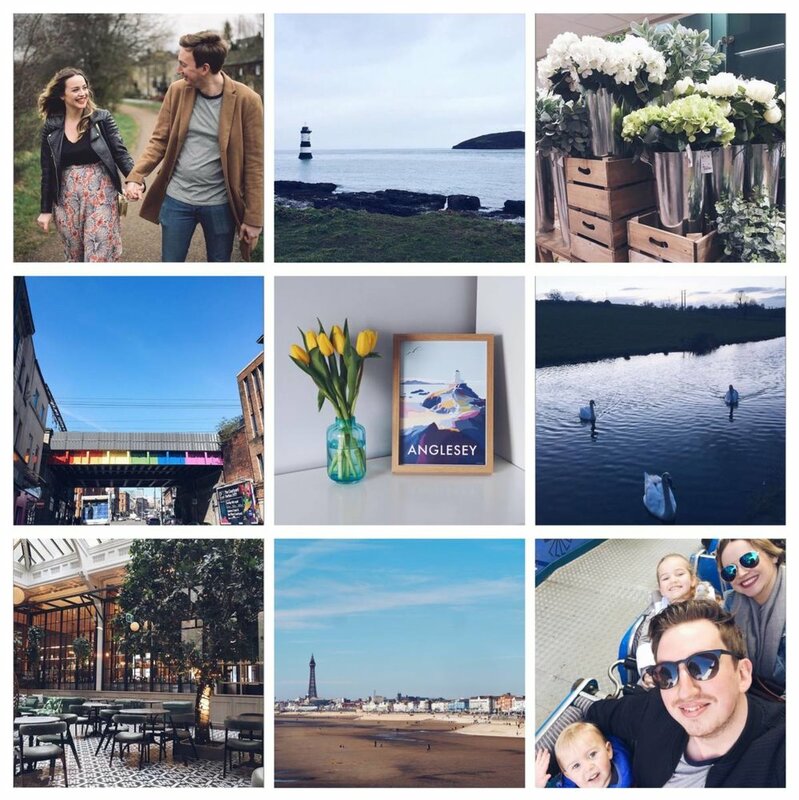 Anyway, here is my little March round up - it's been such a fun month! Chatting to Gemma Cairney live on Radio 1. Checking out some fab new shops in Leeds. Revisiting our beautiful wedding venue in Anglesey. Sheltering from the relentless rain in a cosy caravan. Booking flights to explore Toulouse and Madrid in August. Exceeding my best ever month of blog stats. Having loads and loads of cuddles with our adorable nephew. Celebrating Mother's Day with my gorgeous Mum. Enjoying all of the blue skies and sunshine we've been having. Shooting our engagement photos with the lovely Jenna. Getting lots of stuff ticked off our wedmin list. Riding rollercoasters at Blackpool with my little cousins. Eating fish and chips by the seaside in the sun. Making plans for the summer. Rewatching Gossip Girl from the every beginning. Meeting some of my fave bloggers IRL. Feeling excited about all of the stuff coming up this month. I have got some MEGA plans this month, including the UK Blog Awards ceremony, my wedding dress fitting (with actual Suzanne Neville no less!) and my hen do! So my main goal this month is just to enjoy the moment as much as possible - to soak it in and make the most of it and treasure all the memories I'll be making. The wedding is coming round SO quickly now and if the time keeps passing as fast it is doing then it will be here before I know it! I know that May and June will both be super busy months so I want to get as much done as possible in April. I'll be making signs, folding paper cranes and emailing suppliers like there's no tomorrow! Now that the weather is getting nicer I've been enjoying spending a bit more time outdoors. I've been going for little lunch time strolls and evening walks along the canal and it's been doing wonders for my mood - it's mad how much a bit of exercise and fresh air can do for your general happiness! I want to keep it up this month - hopefully the weather will play ball. How was your month? What are your goals for the month ahead?